One of the benefits of growing up in an area with lots of Maltese and Italian families was that every year the fiesta would be held at the local church, and all sorts of traditional goodies would be made and sold at the stalls. There would be slabs of peanut and almond brittle, pastizzi (my favourites flavours remain fetta cheese and curried pea), gingerbread and hard honey biscuits shaped like hearts, baskets, horses, mermaids...and more. Now I have to trek to the Norton St Festa at Leichhardt if I want to find these things, but they always remind me of being a kid. I've never seen these sold other than at a stall at a festa, but last week a friend of mine found them in a deli. They were called Mostaccioli, or "little moustaches", and certainly this is how they were shaped. Finding a recipe for these is hard! It seems they go by a number of names, depending on the region. From what I've been able to gather from the Internet, they're Calabrian in origin, and probably Arabic before that. The ones I know are a hard biscuit flavoured with honey, but there seem to be variations that use vincotto, aniseed flavoured liqueur, or nuts. Some recipes include milk and eggs. I wish I had a nonna! The most basic recipe I've found uses honey, water and flour. This seems to be the most traditional recipe and it fits with my idea of the biscuit. It's dense, and HARD - you really need to gnaw at them, and they make a wonderfully satisfying crack when you break them. So here's my attempt. This is a small batch because honey isn't so cheap I wanted to waste cups of it in a potential disaster. This page had lots of interesting information, but the english translation isn't very good (and at times amusing). -Warm the water and honey in a saucepan until melted and mixed, then pour this syrup into a mixing bowl. 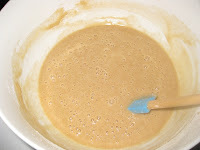 Sift flour into the mix bit by bit until it comes together to make a thick, soft dough. Wrap and leave in the fridge overnight. -Knead the dough until smooth and then shape it into biscuits. -Bake until golden, then allow to cool. The dough came together surprisingly well, although I was just guessing at the texture and how much flour to add. Like a lot of Italian recipes, it was simple, but time consuming. You don't want to rush by dumping in too much flour, or trying to speed things up with a beater. 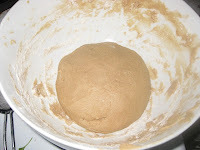 The amount of flour to add will vary depending on the type of flour. Making the shapes also is a skill I don't have - I made some very basic shapes, and also used a cutter. The baking temperature was tricky to work out, although I have an awful oven. The first batch burned, so turned the oven way down to 150 degrees C for the second batch. I also gave up on trying to make fancy shapes and stuck to rounds. What I did learn from the burnt batch is that they tasted pretty good, and that this dough is better thick than thin - the rolled shapes were rock hard and pretty inedible. The second batch also tried to burn, but I caught them in time. I also experimented with some glazes - olive oil or milk, but that didn't make any difference. So the verdict is that they taste pretty close to the real thing, which is better than I hoped for on the first attempt. My family makes a version of these cookies. We call them quadrate. They have citrus zest and waknuts in them. This version comes from Sicili and were made by fishermans wives and caried inside the fishermans coats. The cookies are very hard and their body heat would warm them and they softened enough to eat. keep stirring honey and baking powder as you take it off the heat . Knead to consistency of bread dough while still warm cut off pieces and roll into. about you 2 inch diameter rope. not flatten your rope so that its about three quarters of an inch high and with your flour covered fingers run them back and forth over the top of your rope the frictionof fingers heat will make a nice smoth shine Top to your cookie . now cut your flattent rope at about a 45 degree angle every 3" and end up with a diamond shape. the last batch I made I cooked on parchment paper 350 for 20 min or golden brown.let cool and enjoy.